Cannabis entrepreneurs long frustrated by barriers to social consumption of their products are finding that CBD is a faster way to getting their products in front of consumers. Where marijuana entrepreneurs have been plagued by delays or outright hostility from public officials when it comes to public use, CBD manufacturers and retailers are finding new opportunities in on-site consumption. That was the case for Christine Smith, CEO and founder of Grön, which makes infused products, including CBD-infused artisanal chocolate bars, caramel sauces and other products. Smith took her products from dispensaries into a cafe earlier this year when she launched Grön CBD in Portland, Oregon. The company carved out space in its manufacturing facility for a consumer-facing tasting room, Grön Cafe. Smith envisions expanding the concept to other cities across the country. Others in the hemp and cannabis spaces are following suit, rolling out similar shops to make CBD more common and lucrative. “In the next year, we’re going to see CBD start to transition out of just health and wellness and into everyday products in your stores,” Smith said. In November, Waseem Ghattas, Gary Tse and Steven Phan opened Come Back Daily in Manhattan. “We basically want to be the Sephora of CBD,” Ghattas said. “We want to have a space for people to get education, hang out and actually try the products. Come Back Daily sells CBD products from third parties such as pre-rolls from Blue Ridge Hemp Co., tinctures from Ojai Energetics and edibles from Lord Jones. 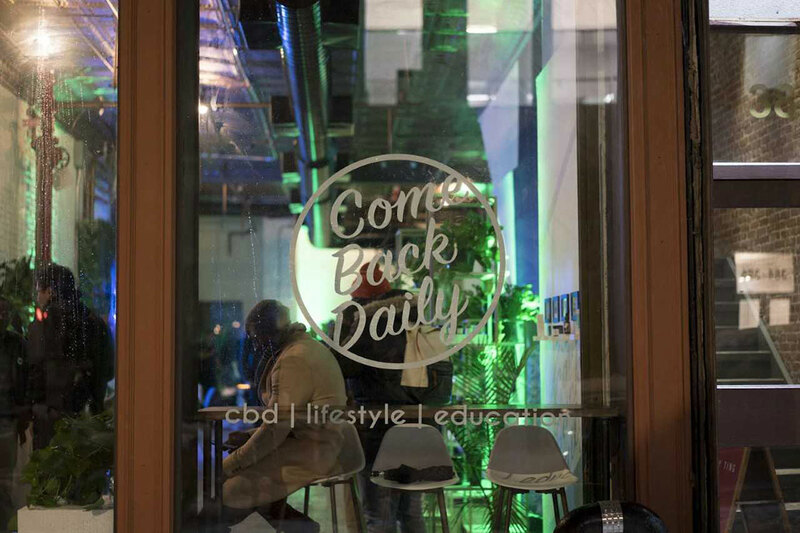 The CBD space gives the shop a foot in the door if New York regulators permit businesses to create social spaces where products made from cannabis can be consumed, Ghattas said. If regulators change the rules, Come Back Daily would expand its offerings THC-infused products, as well. The Grön Cafe tasting room unveiled in June is small at 700-800 square feet in Grön CBD’s roughly 2,400-square-foot manufacturing facility in southeast Portland. A dozen customers at one time would easily fill the space. The company’s director of operations, Jenna Rice, used her experience in a Northwest bakery chain to develop an intimate, sleek retail space devoted to CBD products. Tight regulations around cannabis consumption were sidestepped by using CBD extracts derived not from cannabis but from lichen from the bark of Asian pine trees. The company declined to disclose its supplier but said the CBD used in its chocolates and other products comes from an FDA-approved facility in the United States. “It is lichen that grows on an evergreen plant in Eastern Asia, in Myanmar – the border of Myanmar. They import it into the United States,” Smith said. Grön also is working with Oregon-based East Fork Cultivars to introduce CBD products derived from hemp. Oregon’s oversight of the hemp industry has begun to closely resemble its requirements for the marijuana industry. For example, hemp producers are required to introduce seed-to-sale tracking requirements. The additional rules give Smith more comfort as she works to introduce CBD derived from hemp into her product line in the early months of 2019. “I absolutely welcome the regulations,” Smith said. Those looking to open CBD cafes should treat themselves like any other consumer-facing retail business, said Courtney Moran, an Oregon attorney who advises hemp producers.